Today’s post is a guest article by Kymm Wilson, on the subject of the very rare LeMat carbine, which he was put quite a bit of work into recreating. 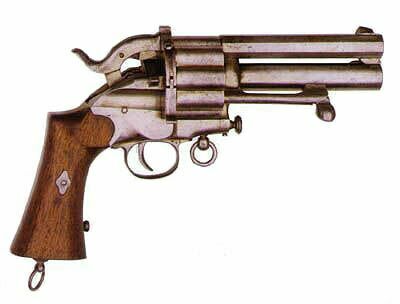 Just prior to the Civil War an inventor named Jean Francois Alexander LeMat invented a revolver known then as the grapeshot revolver. It sported a nine shot .42 cal cylinder with a .62 caliber shotgun barrel as the central axis which the cylinder revolved around. The gun was promptly put into small production until the war broke out when LeMat found buyers and production facilities in Europe. The pistol was produced in excess of 4,000 units for the Confederacy and was a prized piece to own (as it still is). Just after the out break of hostilities the inventor must have seen the benefits of extending the barrels and mounting a stock must have become obvious, as in early 1861 a patent drawing from England appears of the first carbine for the Confederacy. The existing carbine serial numbers go up to 200 and this might increase as I personally have found three examples in a back room of Royal Thai armory. The carbines function identically identical to the pistols, except that the rear sight is a leaf set up on the chamber end of the barrel. This increases accuracy dramatically compared to the pistol, where the rear sight was a notch in the top of the cocked hammer. In addition, the carbines show a fair bit of variation in the bore sizes. For example, S/N 7 used a .44 caliber pinfire cylinder and a .56 caliber rifled center barrel, while S/N 152 had a longer main barrel and a 20ga smooth center barrel. S/N 206 had a .58 caliber center barrel, and this one (S/N not mentioned) is another smoothbore 20ga. The bore sizes of S/N 60 are not mentioned, but there are some nice photos of it here. The gun is a visually arresting looking piece and must have been a great complement to any cavalryman lucky enough to have one. 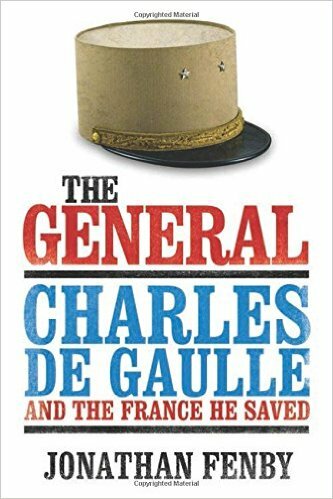 There is big debate as to its use in the Civil War, which seems silly to me. The gun was produced to a number of 200 hundred and all existing (18) are stamped with British proof stamp for Confederacy. While existing orders for the actual guns have not been found, there is a receipt from the Confederate Richmond Arsenal for the ammunition used by the LeMat carbine, suggesting that they may have been used. And truly, if put yourself in the builders’ and Confederates’ situation the gun was built (no question) and the Confederates would certainly have taken whatever was available. The documentation suggests that the Confederate government rejected the carbines on the basis of price, but a small number may well have been acquired by individuals or small units. LeMat was actually far ahead of his time and produced the pistol and the carbine in pinfire cartridges bth before and during the war – these are very Victorian steampunk looking. He also saw the problem of lead splash to the support hand and multiple chamber discharge as a potential safety problem, and made a flat front trigger guard as a rest for the support hand. If used, this effectively eliminates the danger posed to the support hand by a potential chainfire. Ultimately the gun is not as well known as its cousin the pistol, which observant viewers will notice in movies such as Cold Mountain and Twelve Monkeys. The issue that occurs with all percussion based revolving carbines is where do you put your support hand while firing? Putting anything in front of the cylinder of a percussion revolver while firing is generally not a good idea and I prefer keeping my hands on my arms. Granted, chain fire is very unusual but it does happen and any revolving carbine (percussion or otherwise) needs some sort of shield front of the cylinder to protect the support hand (and arm) which will inevitably be holding the gun forward to steady the aim of the user. Besides chain fire, there’s the fire lapping that escapes the cylinder gap as well. Interesting gun. 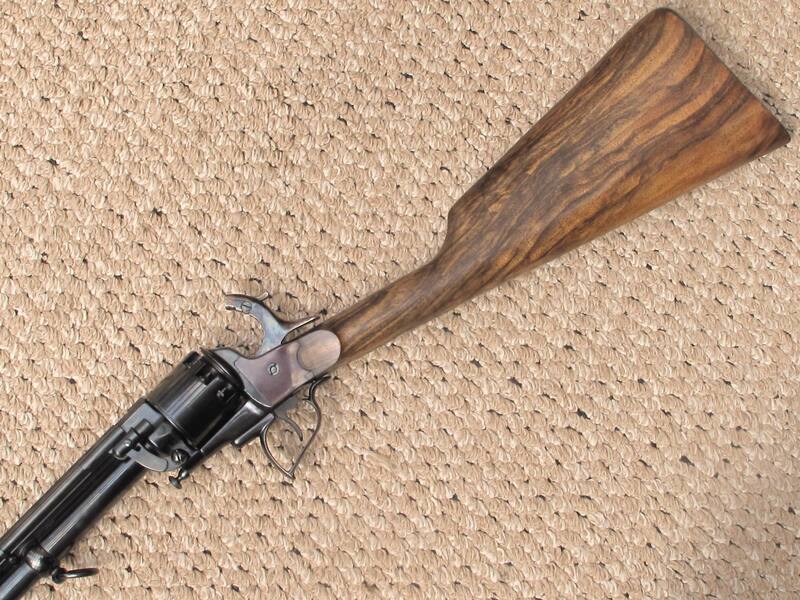 I was never aware of a LeMat carbine and this looks like a beautiful replica performed with masterful workmanship. 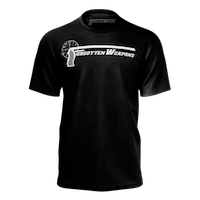 That odd-looking triggerguard was meant as a place to hook your offhand forefinger, while wrapping your off hand around your shooting hand in something like the old “overlap” two-handed grip of the Weaver stance (as opposed to the modern two-hand “push-pull” grip). The idea being to support the weight of the barrels with both hands while keeping your off hand down out of the way in event of a chainfire. Some Colt Thuer centerfire conversions equipped with stocks had a “hook” screwed to the front of the triggerguard for the same reason, which seems odd since you wouldn’t expect a metallic-cartridge arm to experience gangfires. I suspect F. Alexander Thuer and/or William Mason were more worried about lead shaving and spitting injuring the shooter’s off hand, actually. Chain-fire is possible in cartridge revolver-style carbine? I can’t imagine pin-fire cartridge fired by external explosion. but this can be avoided positively only by Nagant-style gas seal or maybe FMJ bullets (which obviously were not used during cap&ball era)? No. Not possible. Chain-fires are a phenomenon of percussion revolvers caused by either slip-fit bullets, or (as Samuel Colt hypothesized) by loose-fitting percussion caps. Well you’ve done a very nice job, turning the replica pistol into a carbine. I never knew they were made in pinfire, I’ve always liked the LeMatt pistols does the barrel/cylinder rotate sort of Mg34 fashion on the bottom pin “looks like the front of a cylinder pin, but it’s lower obviously” to load cartridges or does that pin separate said section from the frame on this percussion model or indeed the other. As you can see, this consisted of a breechblock with its own floating firing pin. To load the center barrel, you cocked the hammer, lifted up the tab on the right side of the breechpiece, pivoted it up and over, out of the way, slid a single cartridge in, and flipped the breechpiece back down again. Note the revolver-chamber loading gate low on the right side of the breech, plus the one-at-a-time LeFaucheux-type ejector rod assembly. This one could be fired about as fast as any single-action revolver, but reloading it must have taken some time. I’d have to call it one of the most “steampunk-looking” real-life handguns of its era. BTW, in their own time these monsters were generally known as “colonial” revolvers, as they were often privately purchased by army officers “going out” to Africa, etc. IMHO, they’d have been better off with a more conventional revolver like a single-action Colt or a double-action Adams, plus a Winchester repeating rifle, but then I’m just a dumb Yankee. I think most (all?) 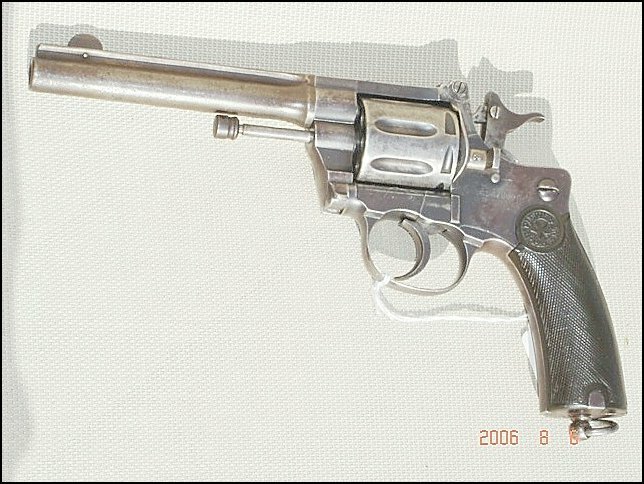 of the original LeMat cartridge versions still used a muzzle-loading central barrel, whether for rifled bullet or for shot. — a particularly wacky one. Clearly the ejector rod isn’t coming out quickly. — the little pin at the bottom of the frame is to keep the barrel section from unscrewing at unfortunate times. Mr. Wilson’s carbine does indeed look very nice! I’m told that Bob Millington, at ArmSport, has done conversions of replica LeMat pistols to use cartridges. Hi Michael. The pinfires tended to retain the percussion shot barrel, I believe, but the centre-fire versions used a centre-fire shot cartridge with a pivoting breech-block. (See the first and third photos posted by Eon above.) It might well be that some of the CF LeMats had a percussion shot barrel, but I don’t think I’ve ever seen a picture of one. Perhaps, there were cartridge-conversions of percussion LeMats at some point, which might have retained the percussion barrel. Unless anyone has any different info? J. B Dix has been telling Doc Tanner that he should convert his LeMat pistol to a carbine for several years now. Doc continues to resist the urge. Doc Tanner is the only fictional character I know carrying a LeMat. Lots of forgotten weapons show up in the Deathlands books. J. B. can keep them all going, of course. Very inventive for its time; a technical beauty. I recently learned about the H Pieper revolving carbine after frantically searching for having seen it in an early 80’s B-movie. It’s a very pretty gun, have you seen/heard of them? I am aware of them, but haven’t had the chance to handle one. The carbine used Peiper’s patented gas-seal cylinder system, that was a forerunner of the Nagant system used on the Russian M1895 service revolver (British patent 2,167, 15 Feb 1886). The carbine used the same cartridge as the handgun, rather on the principle of the Winchester M1873 rifle in .44-40 WCF and the Colt “Frontier Six-Shooter” commercial version of the M1873 Single Action Army revolver in the same chambering. Cool…but not very functional. I can see why the concept never truly caught on. I hardly think it “solved” the problem of lead splash and multiple chamber fire by making a trigger guard that the hand could be used on. One of the main advantages of a carbine over a pistol is the stability of the way you hold it. The stock part is still there, so it gets part of the advantage, but not being able to put your off hand forward of the trigger guard when firing kind of negates a very large part of the entire point of it being a carbine. Not nearly as stable of a hold. Not to mention, one of the reasons cylinder gap is no big deal is that you don’t hold a revolver a couple inches from your face when you fire. Well…at least you don’t unless you’re firing this gun, that is! Don’t get me wrong, neat bit of history, cool replica. Would love to have one on my wall. But as a weapon it was a doomed concept. THAT is cool. Now I want one… a replica, of course. More years then I care to remember I was at an interesting shop on Long Island buying some gun parts. While talking to the owner I noticed an odd-looking LeMat hanging on the wall. The owner told me it was a carbine that he had picked up on one of his trips overseas. Considering some of the other stuff he had in the place I had no reason to doubt him. I do remember thinking that the barrel wasn’t more than 18 inches or so long. 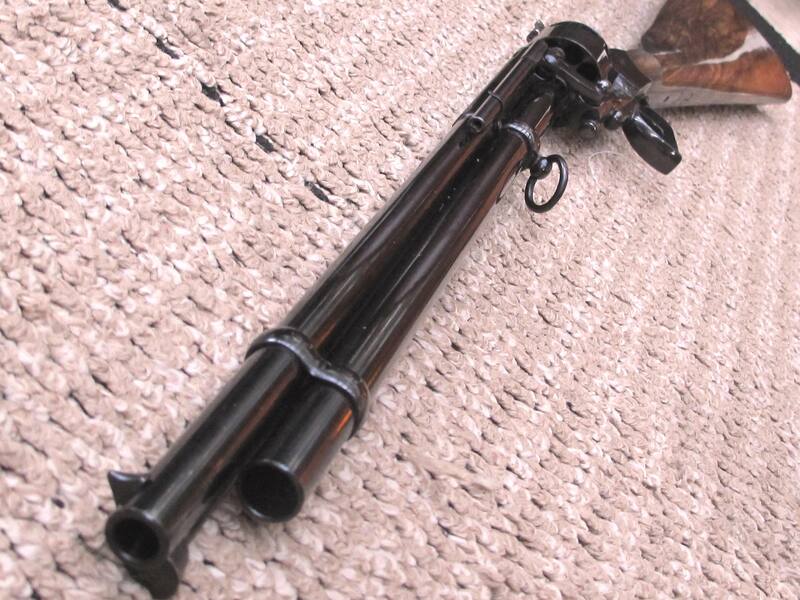 weather permiting i will take the lemat carbine out this weekend to live fire at the range im thinking 3f powder 50 grains in shotgun barrel with nine rounds of double ought buck along with the nine rounds of 44.
Who makes the reproductions of the Lemat Carbine?